Over the last several weeks, I've come across many articles in fashion magazines and style sections of newspapers congratulating Diane von Furstenberg on the 40th anniversary of her “creation” of the wrap dress. Diane von Furstenberg certainly made the wrap dress popular, and that dress propelled her to designer superstardom, but another woman beat her to the wrap dress…by decades. I had seen Elsa Schiaparelli’s work in museums, knew her face from perusing old photographs of the Paris art scene pre-World War II, and had sniffed some of her perfumes, including the most famous, Shocking, before reading Judith Thurman’s great 2003 New Yorker article, "Mother of Invention,"1 but that article sent me on a more in-depth trip of discovery into the world of Schiaparelli. In case you're interested, among Schiaparelli’s inventions and innovations are: the back-less swimsuit — it had a built-in bra and was patented in the U.S.); camouflage and animal prints; themed — Circus, Zodiac, ethnic — collections (Yves St. Laurent would copy his friend and idol in this regard); dresses made of paper, scarves, plastic (Project Runway’s crazy designer challenges would have been a piece of cake for Elsa); culottes; wedge-heels; graphic, trompe l’oeil knitwear -- it didn't sag due to a technique combining wool and metallic threads ; accessories made of plastic — earrings and a cool “bug-studded collar”; the use of obvious plastic zippers as design elements in couture; overalls; the sleeve-less tank top; ready-to-wear mix-and-match separates; jumpsuits; those big-shouldered power clothes we associate with Joan Crawford at her peak; see-through raincoats; folding eyeglasses; colored hosiery; the shirtwaist jacket; athletic clothes (including her "shocking" split tennis skirt); and fantasy furs. Oh, and the wrap dress. If this has whet your appetite for Schiaparelli, do look online and find some of her quirky pieces: gloves with gold claws (they look like bear paws to me); her lamb-cutlet and shoe hats, the beautiful “lobster” and “rabbit” gowns. She was also a designer who teamed up with artists for her work, collaborating with Dalí, Kees van Dongen, Christian Bérard, Jean Cocteau and Man Ray. Ever wonder who created the “fashion-show-as-spectacle” in 1935…complete with music and rail-thin models? I don’t think I need to tell you at this point. Coco Chanel and Schiaparelli were contemporaries (just seven years apart in age) but they were so different in their style philosophies and backgrounds that there was little chance of a friendship developing. Chanel referred to Schiaparelli as an “Italian artist who makes clothes,” and I’m embarrassed to report that Schiaparelli called Chanel: “…that dreary little bourgeoisie” or “that milliner” (Schiaparelli never learned to sew). I usually side with the underdog, the “rags-to-riches” character (Chanel in this case)…but though Schiaparelli was a bit of a snob (born into the Italian “aristocracy” and raised in a palace in Rome), she won me over to her side due to her World War II work. During the Occupation, Chanel stayed in Paris and lived at the Ritz with her Nazi officer beau and schemed, using her Nazi connections, to gain control of the lucrative perfume business bearing her name but owned by her partners, the Jewish Wertheimer family who were in exile. (Chanel was unsuccessful.) During the war, Schiaparelli closed her Paris business, moved to New York and spent her time doing relief work for the Allies and the Red Cross, and volunteering as a nurses’ aide at Bellevue Hospital (I'd love to know what she wore on duty). 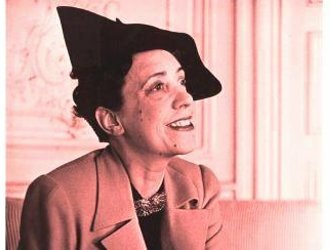 You can tell I'm a Schiaparelli fan-guy, because that’s probably my longest perfume-review intro EVER, but I think Elsa Schiaparelli deserves a shout-out, don’t you? So many designers have copied her over the years…almost all without attribution. Sometimes I wonder how many fashion writers are familiar with her extensive portfolio and how it relates to what’s being made today. Snuff opens with a whoosh of lavender and moss, a nose-singeing experience. As the opening evaporates, I smell an evergreen note (cypress? pine?) Evergreen leaf aromas persist for quite awhile (existing quite happily alongside a strong galbanum note). As Snuff enters its final stage of development tobacco arrives…a smooth, “liquid” tobacco scent (not smoky or ashy at all). In Snuff’s extreme dry-down, I detect a hint of silken iris, almost powdery, and semi-sweet, old-fashioned musk. Snuff’s character is refined without being “stiff”; it’s a fragrance you can wear anytime: whether you want to be dressy or simply smell good at the office. Though Snuff persists on skin all day, it is buoyant and “cool” and never makes me wish it would “go away.” I’m so glad I bought Snuff (my bottle aged well apparently). To my nose, Snuff is a blatantly “masculine” perfume. Schiaparelli retired as a clothes designer in 1953 and lived on for 20 more years (her perfume business flourished and made her rich). After her death, Schiaparelli's perfumes, and legend, slowly faded away. Chanel, her wartime "mistakes" forgiven, had a late-life revival of her business. Chanel's name is as famous as it ever was and the Chanel perfume line is prosperous. But this year, things are looking up for Schiaparelli; the fashion house is being revived, and I hope some of the perfumes will be brought back with brio and in the Style (yes, a capital S) to which Schiaparelli, the woman, was always accustomed. 2. New Yorker, “Radical Chic” March 26, 2012, by Judith Thurman. 3. Listed notes of original Snuff are: bergamot, galbanum, green notes, lavender, evergreen notes, carnation, iris, geranium, jasmine, rose, patchouli, vetiver, sandalwood, ambergris, leather, musk, moss, myrrh, vanilla and frankincense. Apart from the two articles referenced in the text, I also read the following articles/books as research for this review: New Yorker, “Scenes from a Marriage” May 23, 2005, Judith Thurman; Universe of Fashion: Elsa Schiaparelli by Francois Baudot, 1997, The Vendome Press; Shocking Life: The Autobiography of Elsa Schiaparelli, Victoria & Albert Museum, 2007; Shocking! The Art and Fashion of Elsa Schiaparelli by Dilys Blum, Philadelphia Museum of Art, 2003. Note: top image of Elsa Schiaparelli [altered] via Wikimedia Commons. 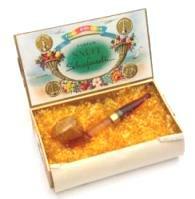 Lower image of original Snuff packaging via LiveAuctioneers. What a lovely article Kevin!! I’m not much of a fashion enthusiast (though I have gotten interested via perfume) but I loved ‘listening’ to you. More please!! I, too, have always been much more of a Schiaparelli than a Chanel girl, despite my working class background. Give me glamour and wit over shapeless, chain-weighted jackets any day. Maybe Schiap didn’t build the marvelous shapes Balenciaga did (love those), but she stirred up joy when the world was pretty ugly. Thanks, Angie. Schiaparelli was a BIG fan of Balenciaga…went to all his shows. I’ve recently read the “Vogue On” biography of Schiaparelli and was both amazed at her genius and appaled at how the Paris couture industry treated her after WWII. The return of her name to the haute couture ranks is more than deserved! Patuxxa…it will be interesting to see how this plays out and how inventive the designs will be. I only realized a few years ago how her influence filtered down to the mainstream: when I was growing up in the 50s and 60s the colour that eventually became known as “hot” pink was called “shocking” pink. I believe Schiaparelli was the first designer to use that colour for garments (or at least successfully use that colour). Thanks for the great intro. Lindaloo…thanks, and, yes, she made that color famous. She also had a perfume called “Shocking”. Fascinating piece! I had always found the wartime exploits of Chanel very dubious but I had no idea quite how badly she behaved! Schiaparelli’s designs still have the power to astonish even now and she seemed so much more fun than Chanel. I hope the new house is equally bold in it’s designs and can we hope it produces a great new fragrance worthy of her memory? Bejoux…that would be great…how could they dare to produce a bland fragrance? You did a terrific job on that post, thank you for the effort. Not to mention the effort required to obtain your specimen! I know little about couture, but she obviously illustrates its intersection with “fine” art. Anybody who collaborates with Man Ray is OK with me. I could take that pipe in the cigar box to be a bit Dada, maybe?? More a cute joke than Dada, but still. Donnie…many references to that pipe being inspired by Magritte…but who knows for sure? Thank you Kevin for a great article! Thanks for this super post on a wonderful woman! I happened to be in NYC during the Schiap/Prada exhibit at the Met and can attest to the delightfulness of her designs. I’ve also been fascinated by her perfumes and snapped up a couple of the less well-known colognes a few years ago, Si and Succes Fou. They both smell great, and very original. One word of caution: my screw top bottle began to evaporate after I unsealed it. If that’s what you have (rather than a spray), I’d recommend adding some teflon tape, decanting to other containers, or something to avoid loss. Noz, thanks for the tip! I think the ‘dreary little bourgeoisie’ comment is gold! I just read that lots of Elsa’s things are being auctioned today in Paris- I’d love to just be there to watch! Perthgirl…I think those perfumes would go well together…. *sigh* I saw an old bottle (not sure how old) of Shocking at an estate sale when I was brand-spanking-new to this perfume thing, and although I knew it was “classic,” I was trying to only buy things I knew I liked, so I didn’t buy it. I’ve kicked myself SOOoooo many times since then! MarjRose: I know the feeling…As a young’un I thought ‘old’ perfume was nasty to buy! Ha! 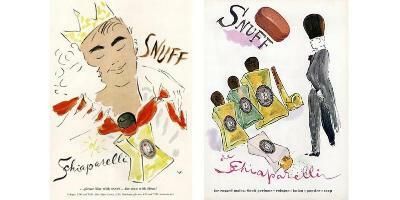 Wow, all the things I did not know about Ms. Schiaparelli…I’ll blame my ignorance on the ubiquity of Chanel the brand. There seems to be a trend lately of reviving the classics and keeping true to the original scent. Hajusuuri…I hope that’s the case with Schiaparelli…why bother if they ignore her legacy? I recently bought some paper fashion doll books that had Schiaparelli designs. Eventually I’ll break down and cut them out. Marsha: hey, think of something shocking to do with those cut-outs! Thanks for condensing an incredible amount of information into this entertaining review. I learned a lot in a relatively short read. Much appreciated. L: thanks so much…glad you enjoyed it. I really enjoyed this article! The idea of Coco Chanel has always left a sour taste in my mouth after learning of her WW2 activities. Elsa Schiaparelli’s legacy is really impressive. I am excited to see her design house revived. Sophiew: someone wrote me privately and asked: “Didn’t Chanel do ANYTHING good?” From what I’ve read…she was really generous with her money when her friends were in need, or even friends of friends…that’s something! Love your article Kevin. Thanks! Thankyou Kevin for a really interesting article!! There is so so much written about Chanel and her life but we are all quite lazy and take whats on offer as regards information. I didn’t know about her inventions and we all have something in our wardrobes that can be attributed to her. Lets hope the revival of her name as a designer extends to her perfumes and that they are done beautifully…..not a watered down pale shimmer of a hint of a perfume. I’m so sick of the 21st century perfumes out there. I recently received a sample of Bandit and oh I have fallen in love. A proper perfume with a proper smell that lingers, is layered, is interesting and makes me smell like a lady. Well done to the American company who did that!! Lets hope and pray that Schiaperelli’s perfumes are in that league. kate: it would be so cool if they’d do powerful, inventive scents under the Schiaparelli name. I’d even accept “pink juice” and bottles if the perfume were sensational. HA! Kevin, Thank you for such an interesting review. You have inspired me to try as many of the Schiaperelli’s perfumes as possible. I’d also love to read about her life. It sounds so glamorous and interesting. Tara: do read her autobio. I’ve hoped and prayed Judith Thurman would tackle S.’s life…Thurman is one of my favorite writers. Her biographies are great…and pack “heat” (emotion). I also went to the Met exhibit. I was under the impression that the Met really wanted to do a Schiaperelli exhibit and added the Prada, in part for sponsorship reasons. One more note, (for the type of person who recognizes the Crawford reference): The film Nitochaka (one of the funniest of all time, and one of the greatest acting performances, by Garbo), features a hat in the shape of a shoe. Garbo, as a Soviet official assigned to Paris, first notices the hat and sniffs that France and Capitalism are doomed because only a decadent civilization would encourage women to wear such idiotic things on their heads. After a few weeks in Paris, (and in the arms of a decadent Parisian play boy), her world view changes, and soon she is seen glancing longingly at the hat in the store display. Soon after, she is wearing the shoe shaped hat. It looks fetching on her*. That hat, turns out to have been a Schiaperelli design and was part of the Met exhibt. * To be perfectly honest, I am sure that Garbo would have looked fetching in one of those wool watch caps which hipsters were wearing even in warm weather a few years ago. I get the feeling you could be adding a lot of great movies to my hold list! Dilana/Marjorie Rose: Ninotchka is a great movie…I need to rewatch it! And you are right about the Prada connection being DUMB in the Met show…same with the Met show of Chanel many years back when Lagerfeld barged in: Miuccia/Karl — unnecessary. Oakland Fresca: surely there’s a good book about Hollywood and its goings-on during the war? Let me know if you find it! Kudos to Schiap for her positive WW2 activities. Always wondered where the “U” back swimsuit came from. Now I know!